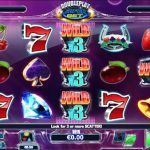 If you have ever wondered what would happened if you combined a classic game with modern features then Double Play Super Bet, a video slot game from Nextgen gaming is the answer. We can see all the familiar retro symbols that we love but with more modernistic look combined with some special features that will make your day. There is plenty going on in the special features department. First, to the right of the reels there are 2 betting options Double Play and Super Bet. If you select the first option you will increase the multiplier to x3, x6 and x9. In the second option you can increase the enhanced wild to the three middle reels. 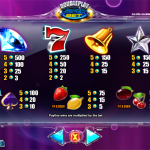 The main feature in this game is the free spins round and the key to this feature is the game logo’s symbol which is the scatter. You need to land 3 or more scatter symbols to activate the round for which you will receive 15 free spins. All the enhanced wilds will be doubled during this round. You are probably wondering what the potential maximum multiplier is, and it is x18 which sounds great, right? Double Play Super Bet is a nice addition to the Nextgen Gaming portfolio. Everything we see here is superb. The design of the game is so appealing with all those classic symbols freely floating on the reels. The options to bet in a different manner are so appealing especially to high rollers and the special features are easy to activate. The betting options are made in that way that they will suit every kind of a player. So no matter if you are a high roller or low roller, or in between, we are sure that you will find the right bet size for you. For another great engaging game you should consider playing Doctor Love a 5 reel slot by NextGen.